COACH 1941 jacket, VALENTINO sweater, and SAINT LAURENT BY ANTHONY VACCARELLO pants and shoes. SAINT LAURENT BY ANTHONY VACCARELLO sweater. VALENTINO sweater, SAINT LAURENT BY ANTHONY VACCARELLO pants, K-SWISS shoes. LOUIS VUITTON shirt and pants. K-SWISS top, pants, and shoes. ERMENEGILDO ZEGNA COUTURE sweater and pants. COACH 1941 jacket and VALENTINO sweater. An entertainer in the most classic sense of the word, Diggy Simmons refuses to be pigeon-holed. 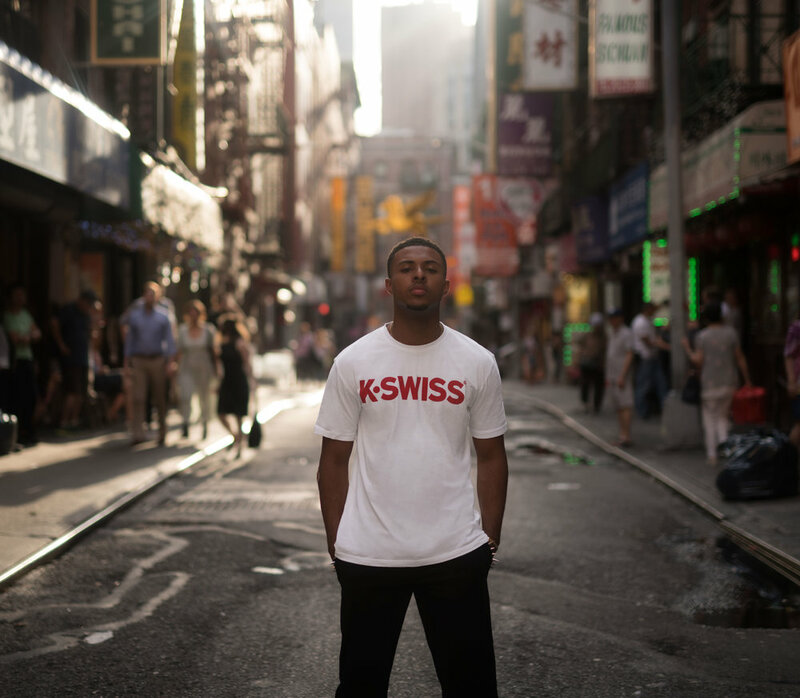 Depending on the day, Diggy may be found walking the runway for Dolce and Gabbana, on set for the critically-acclaimed spin-off Grown-ish, or in the studio working on the much-anticipated follow-up to his 2012 debut, Unexpected Arrival. His ambitious confidence is palpable even through the phone; he speaks in a slow, swaggy voice that makes it sound like he’s always grinning. “You have to work on projects you genuinely care about,” he tells me, when I ask him how he balances so many creative endeavors. 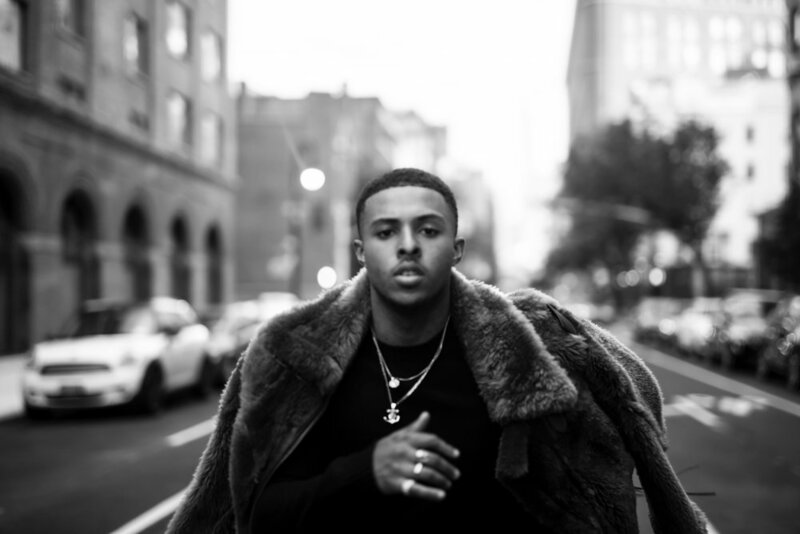 “Whatever’s on my radar at the moment, whether it’s a role I’m in love with or a track I’m working on, I’m like locked-in focused on that one thing.” While Diggy is best known for his music and acting, his last year has been dictated primarily by fashion; most recently he appeared in a 3-day Coach event earlier this summer. “Fashion for me has just been about a love of clothes since I was like a little kid. My mom’s been tellin’ me stories of me at, like, five years old, not letting her pick out my clothes for school ‘cause I had to do it myself,” says Diggy. This reminds me of a scene from an early episode of Run’s House where a pre-teen Diggy is acting precociously picky about what he’s going to wear to some fancy event, and Reverend Run is getting on his case for owning “more suits than James Bond.” Diggy then cracks wise back at his dad in classic “That’s Diggy for Ya!” 2 fashion, making for great content in the Golden Age of E!reality television. I think to myself that now might be a good time to mention to Diggy that I feel a sense of closeness with him, given our generational kinship and the fact that he grew up in Run’s house and I grew up watching Run’s House with my mom, but I don’t know how to say this without it seeming weird and forced and luckily he’s already changed topics on me. K-SWISS t-shirt, pants, and shoes. Not long after hanging up with Diggy, I realize I have made a horrible mistake; somehow I forgot to ask about his unique upbringing as the son of one of Hip-Hop’s most influential figures, and the pressures that must surround a young star anxious to make a name for himself untainted by perceptions of nepotistic luck, a name that is uniquely and solely Diggy. And then I realize—he already has.